This easy recipe for corn shrimp chowder has so many wonderful flavors of summer! Sweet corn, tender shrimp in a creamy, dreamy soup…the perfect summer lunch or light supper. 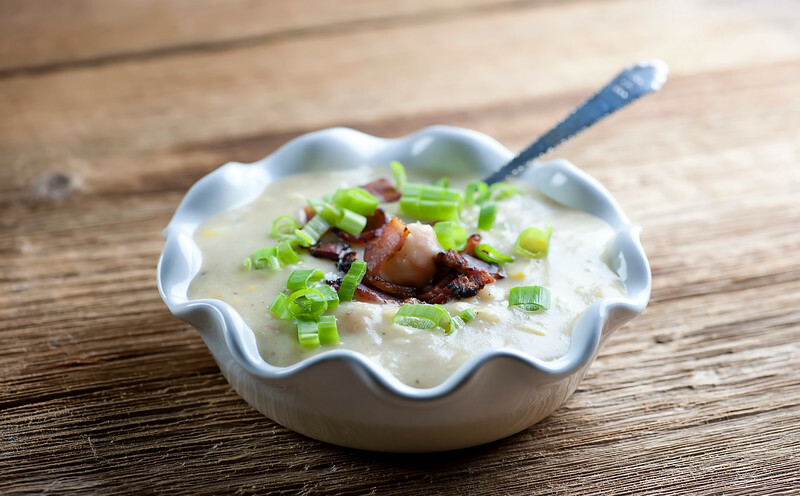 Oh, this soup…now that it is August and the sweet corn is all around us, this corn shrimp chowder is going into constant rotation in my house. 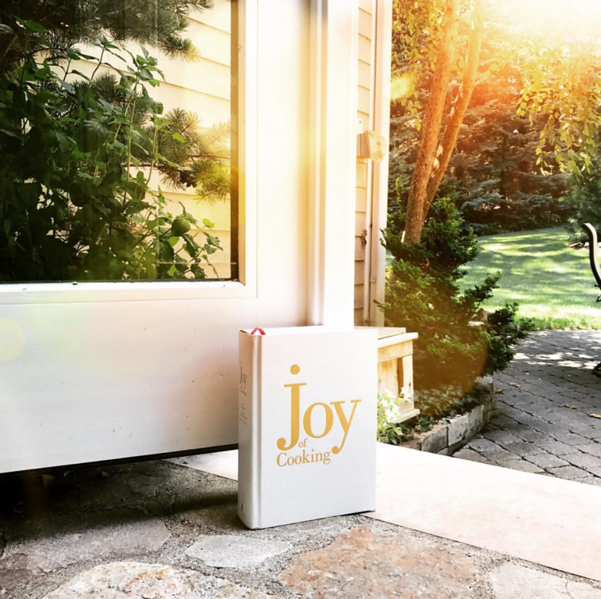 Not only is it ready in a jiffy, but it combines two of my favorite summer flavors…corn and shrimp…along with one of my favorite 365 days a year flavor, bacon! It’s delicious both piping hot right out of the pot, and also cooled down to room temperature for those sultry summer evenings. So the next time you are picking up some fresh ears of corn at your local farm stand, toss a few extra in your bag and let’s make it! And speaking of summer evenings, after a string of hazy hot and humid, the last couple of weekends have been nothing short of perfection, weather-wise. The kind of days where you fling open all the windows, and in some cases the back door. Never let it be said of the Southern husband that he let the lack of a legit doorstop keep him from flinging open any doors. Meanwhile, back at the chowder…this is a potato and milk-based soup (which is why I get to call it a chowder) that involves cooking up the veggies in a mixture of bacon drippings, chicken broth, milk and some spices, and then pureeing it all up into creamy thickness. You can either do this by pouring the cooked veggies and liquid into a blender, or even better, pureeing it right in the pot with your handy immersion blender. Once you have your soup nice and pureed, add some fresh corn kernels (click here for a neat way to cut kernels off the cob) and the shrimp, and let it all simmer up just until the shrimpies are cooked, about 3 minutes. Now ladle it into bowls, garnish with that bacon and a handful of scallions and you are ready for summer corn shrimp chowder. Cook bacon in a large deep saucepan over medium high heat until crispy. Remove with tongs to a dish lined with paper towels. Add half the scallions and all the potatoes to the pot and stir over medium high heat until scallions start to soften, about 2 minutes. Add flour and stir, and then add milk, Old Bay and chicken broth. Simmer until potatoes are tender, about 10 minutes. Transfer to a blender (or better yet, use your handy immersion blender!) and puree. Return to pot and add corn kernels and shrimp. Simmer until shrimp are just done, about 3 minutes. Season to taste with salt and pepper. Ladle into bowls and sprinkle with remaining scallions and bacon. 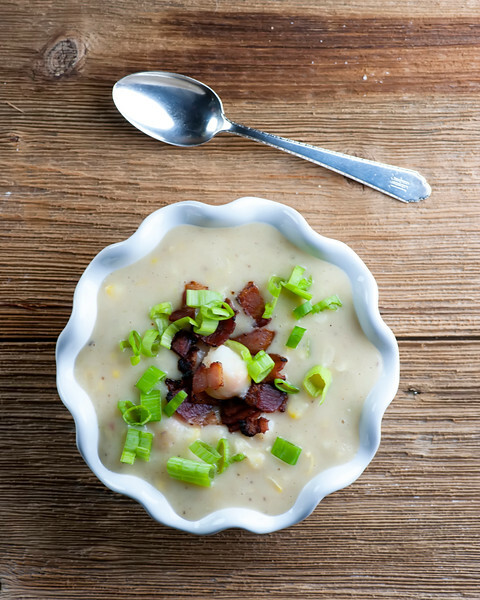 Love this twist on corn chowder! Perfect for summer! I go to the farmer’s market every weekend, so I will be trying this ASAP! Thanks Beth! Aren’t farmer’s markets the BEST? I just had some corn and shrimp chowder today at a restaurant and it was not creamy like yours. And it was missing on of the key ingredients–bacon! This chowder looks delicious! Bacon makes EVERYTHING better. Thanks Thao!